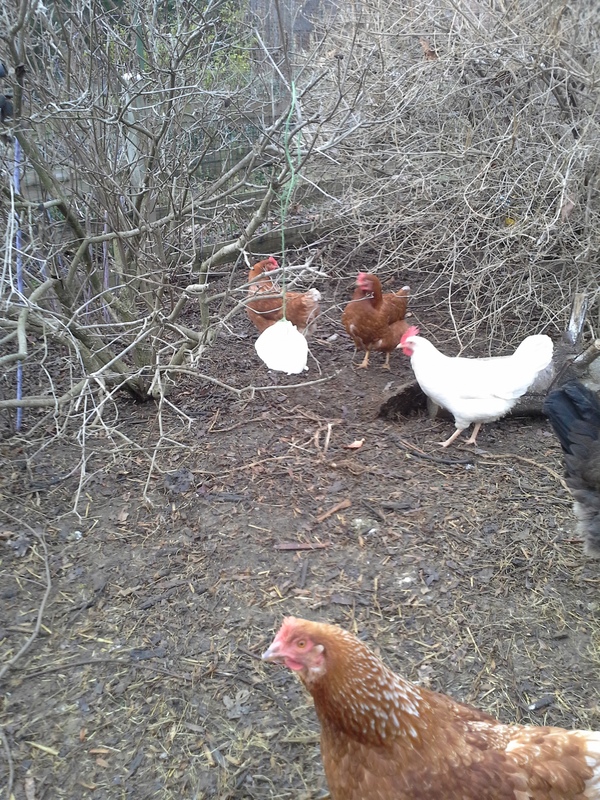 Remember that back in November I added 5 young hens at the point of lay to my flock of 8 older girls. It wasn’t too pretty for a while, as the older hens came to accept the new ones. We had some injuries. By late January I am pleased to report that everyone was getting along, one group not two, with the hierarchies that chicken social life requires. Many thanks to my vet Dr. Sarah Chapman, who suggested making visual barriers across the run. 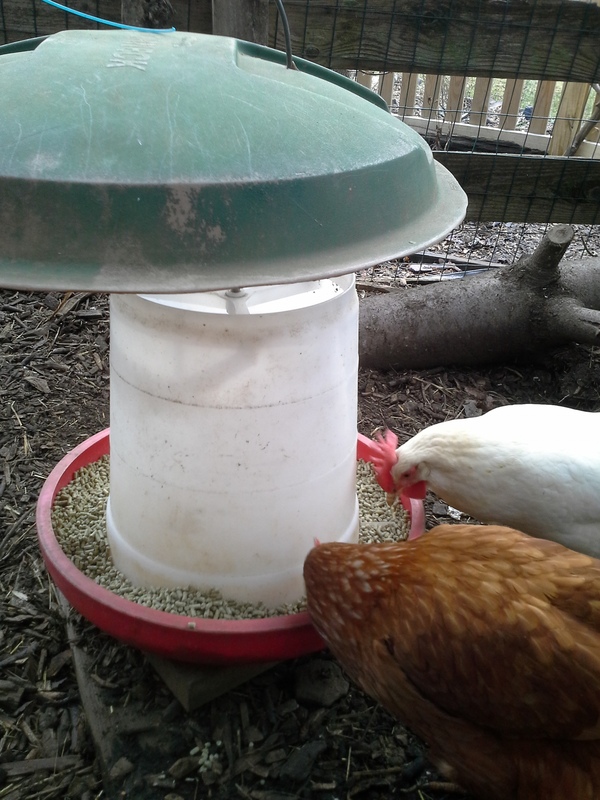 I used cardboard panels and put feed and water in several locations. Now every bird can eat and drink in peace. …and tried hanging it up in various places, looking for the right location and height. 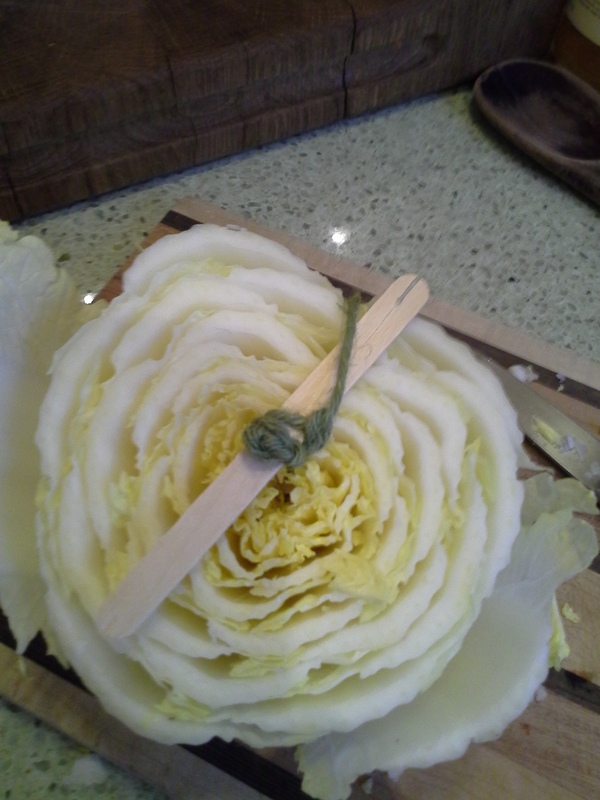 Hanging the cabbage on the fence was the trick. 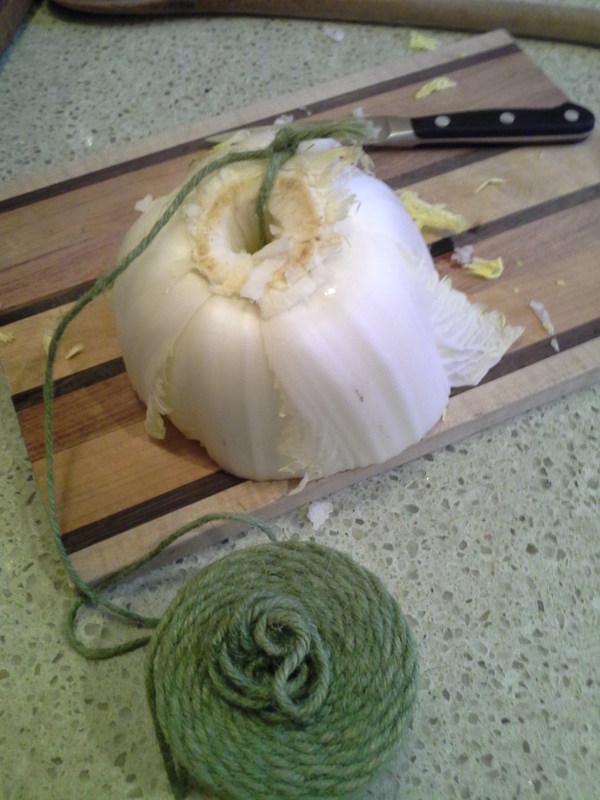 At first the hens didn’t recognize this pale green blob as food at all. Since I tried this twice with success, I have come across debate online about cabbage being toxic to chickens. It is my impression that chickens like most animals will not eat something that isn’t good for them (sheep may be an exception to this rule), unless they are desperate. Do not allow them to be desperate, and don’t offer any one food to excess. Offer a wide range of veggie scraps, seeds, and PLENTY of mulchy stuff for them to dig through for entertainment. Chickens aren’t bright, but if they aren’t bored to death in confinement or hunger for something that isn’t pellet, they should know what’s for dinner. 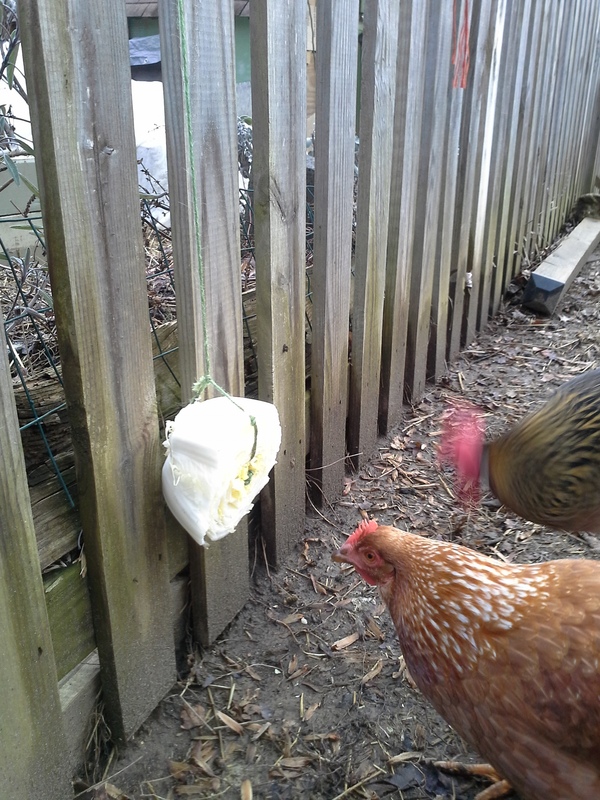 That’s a cute idea with the cabbage to keep chickens entertained. I’m glad your chickens eat what is good for them. When our flock had limitless food on nearly an acre of land, they chose to eat all the paint off every wooden surface. I’ve heard lots of stories of chickens eating metal, styrofoam, you name it. Our cochin does have expensive taste, too…she grabbed my daughter’s pearl earring out of her ear and swallowed it! ha ha I hope you and your flock have a great day. Wow, Merry, yuck. I have heard those stories too, but have not experienced the behavior here. Maybe I’ve just been lucky. Six years experience isn’t that long – maybe I still will. Why do you suppose it happens? I have to think that animals who eat poisons (paint/styro) instead of food will not be around long, in nature’s systems anyway, so maybe our breeders are procreating the wrong strains of animals. That’s a great story about the cochin and pearl — did you sift through the chicken plops to find it again, as in the story about the yellow lab Marley? Wystan – I am loving your blog. You make me wish I was just starting out (at an appropriate age) in the chicken fun. I haven’t been out to see our girls in over a month, but Don is doing his duty for them. He has very basic goals – food and water – doors open – doors closed. Their only consistent winter treat is left over communion bread. Since I am known lovingly as the egg lady at church, everyone on the communion prep list knows to leave the bread for me after service on Sunday. This practice may not be approved by the ELCA Council, but the chicks love it. Keep it up – I’m a fan!